Undershirts, under-socks, and why no jacket? Keep your head warm, wear warm footwear keep your core warm. Bring a flask of scotch, and keep sipping. Certainly I have found that with wool hose, a sweater and/or jacket, and a really good scarf, my kilt is comfortable at rather cold temperatures. Granted, I haven't lived in Canada, but I spent a few winters in Beijing, which can be pretty raw for much of the year. That said, I really like the "kilt johns" idea. Searching online, I found various vendors offering merino wool or fleece "boxer briefs," some of them "extra long." These would go a long way towards ensuring adequate warmth in your kilt on cold days. I intended to order some myself to prepare for the next Beijing winter, but instead I found a job near Hong Kong, where the weather is more like Florida. I have not found my long overcoat to be all that helpful with the kilt. 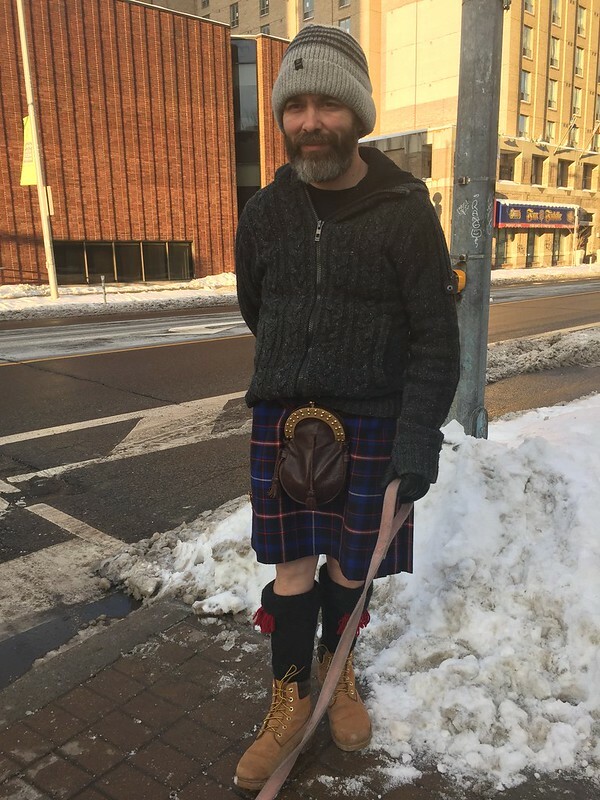 But I made an ankle-length cloak out of velour and found that it kept me quite comfortable as I walked around New York City kilted in the snow one January weekend (I was taking my wife to the Metropolitan Opera and wore the kilt and Prince Charlie jacket). So you might want to look into a proper cloak as well. Good luck in your quest for warmth. If you have time, you ought to look into getting a Balmoral bonnet. I would never want to go bareheaded in the cold. So if your wife has nixed your flat cap and you've wisely chosen to forgo the baseball cap, another headgear choice is desirable. Balmorals are both traditional with the kilt and provide excellent warmth in cold conditions. You could also follow McMurdo's lead above and wear the ever-popular Canadian tuque. This would provide some cover for your ears as well. But I'd definitely think about something to keep your head warm. Balmorals do work with earmuffs too.